The Making of a Great Newspaper, The New York Times, 1923. Collection of The Skyscraper Museum. Until 1997, the New York Times was headquartered and printing in a multi-story, ch�teauesque, glazed-terracotta factory on West 43rd Street, just a block from the 1903 skyscraper that gave its name to Times Square. 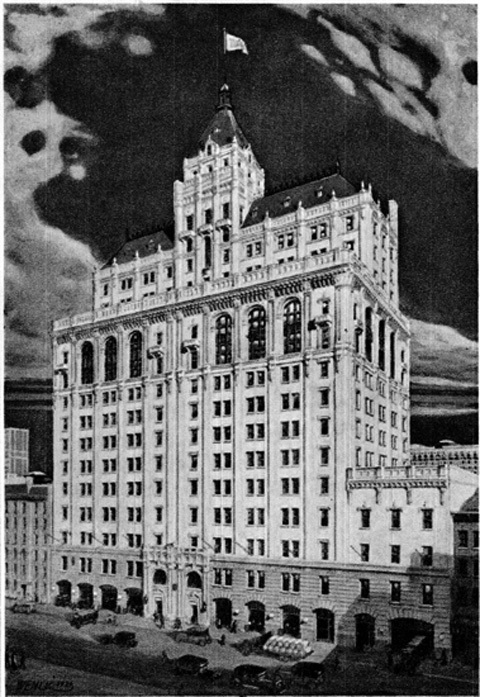 The paper built the Times Annex Building in 1913 with an eleven-story structure designed by Buchman & Fox, that was engineered to anticipate expansion. The need came rapidly. 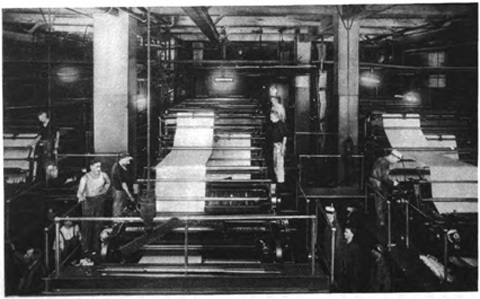 With daily circulation reaching 313,000 copies by 1921, the Times doubled the plant's printing capacity, increasing the floor space from 170,000 to 318,000 sq ft with a matching eleven-story addition on the west, a four-story "attic," and seven-story setback tower rising above the whole designed by Ludlow & Peabody. In 1932, Detroit-based architect Albert Kahn added another west wing. While other newspapers moved printing operations to areas with cheaper rents, the Times continued publishing from the Annex until 1997, when they relocated their printing to a new plant in College Point, Queens. Today the 52-story New York Times Building on Eighth Avenue and 41st Street, design by the Renzo Piano Building Workshop with FXFowle, and completed in 2009, only houses the paper's white-collar workforce.